TOHONO O’ODHAM NATION — (Nov. 23, 2011) The US Homeland Security is now pitching new spy towers to the Tohono O’odham, after Homeland Security wasted billions on the last boondoggle of Arizona spy towers that did not function. 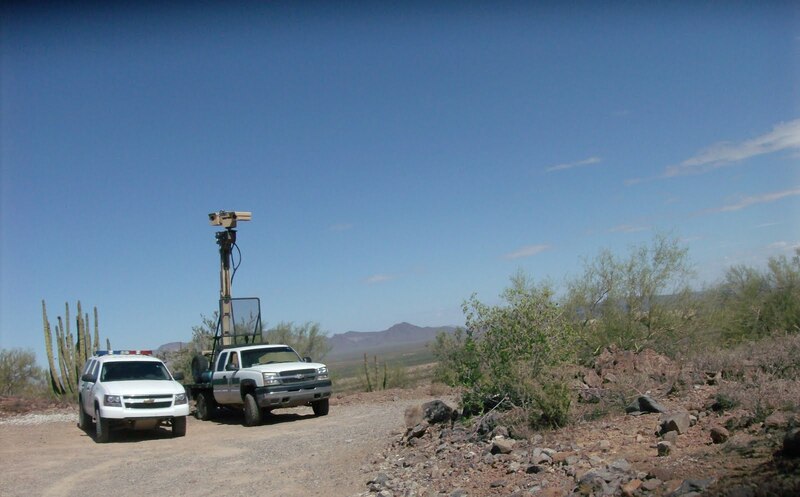 Previously on the Arizona/Mexico border, Homeland Security’s Secure Border Initiative spy towers were pointed at the people of the community in locations like Arivaca and not at the border. Those spy towers, including one on the Tohono O’odham Nation south of Sells, Arizona (shown below) were fashioned after Israeli’s Apartheid Wall. Those spy towers were built by Boeing and the Israeli defense contractor Elbit Systems. Then, Homeland Security announced in Jan. 2011, the replacement of the previous boondoggle SBInet with the Alternative Southwest Border Technology. It also referred to as Arizona Border Surveillance Technology. Homeland Security is now presenting new spy towers, shown below, to Tohono O’odham districts for approval. The Tohono O’odham elected government has been able to censor the media by not allowing outside journalists into Tohono O’odham Legislative Council sessions.The Tohono O’odham elected government also controls the movement of mainstream media when it attempts to cover news stories on the Tohono O’odham Nation. The elected Tohono O’odham government spoonfeeds the mainstream media and the result is public relations hype published in newspapers who are sometimes considered credible, like the Los Angeles Times and New York Times. Tohono O’odham activists who attempt to protest the Tohono O’odham government, which has been coopted by US Homeland Security and Border Patrol, are followed and threatened by US Border Patrol agents and Tohono O’odham police. News reporters who attempt to cover the real story, and grassroots Tohono O’odham who speak out against the US surveillance on sovereign Indian land, are also stalked, detained and threatened by US Border Patrol agents.